A couple years ago, President Obama hailed Spain’s promotion of wind and solar energy through massive subsidies as a way to grow the economy and create jobs. At the time, Dr. Gabriel Calzada explained that the Spanish success was a mirage and that Spain’s “success” was actually costing jobs and creating a huge financial liability. Now, the reality of Spain’s disastrous policies is clear to the Spanish government. Hopefully, the unsustainable nature of subsidies will become clear to the promoters of wind and solar as well. Beginning next year, Spain will halt new feed-in-tariff (FIT) contracts for renewable energy. Feed-in-tariffs are used to accelerate renewable investment by providing long-term contracts that pay the owners of these projects above-market rates for the electricity produced. Because renewable technologies generally cost more than conventional fossil fuel technologies, the government guarantees that renewable firms get the higher cost for their technologies. Consequently, utilities or consumers or both pay more for electricity. Similar policies have been proposed in the United States. Spain is changing its position on renewable energy FIT contracts due to fiscal challenges and lower credit ratings. 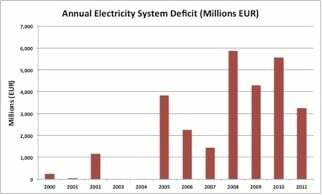 The electricity system deficit due to the higher cost of electricity is over 24 billion Euros and that amount is growing. To put this in context, this is $520 per Spaniard. Spain does not allow its electric utilities to pass on the increased cost of electricity produced from wind and solar to ratepayers and this includes the above market rates the FIT entails. Over the past decade, the utilities have been forced to pay above-market rates to the producers of wind and solar through the feed-in tariff, but they have been unable to charge the cost of the feed-in tariff to ratepayers. As a result, the electricity system deficit has increased over time. Spain began deregulating its electricity market in 1997 when it supposedly allowed generators to compete among themselves. However, Spain also decided to control rates to consumers to avoid unpredictable market variations in electricity prices. 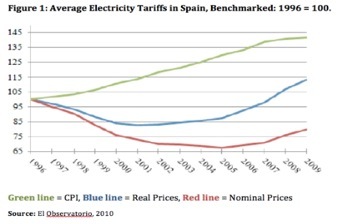 The result on electricity prices can be seen in the following graph that compares Spain’s consumer price index, and real and nominal electricity prices, indexed to 1996–before Spain deregulated its generating sector. Instead of allowing utilities to increase rates, the government allowed utilities to maintain a deferral account that allowed them to recover shortfalls in any individual year from revenues generated in subsequent years. The following shortfall in the financial statements of its utilities was created that resulted in a growing electricity system deficit because revenues from future electricity sales were insufficient to pay for the cost of the electricity generated. Contributing to this shortfall and stemming from unemployment above 20 percent is lower electricity demand that declined 2.6 percent from its peak in 2008 resulting in excess generating capacity. 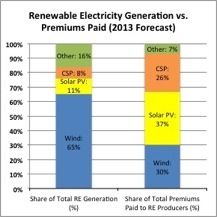 The following graph depicts the share of each renewable energy source projected for 2013 compared to the premium payments that will be received by that technology in that year. While wind power will remain the largest source of renewable generation (65 percent), it will represent less than a third of total premiums paid (30 percent). In contrast, both solar PV and concentrating solar power (CSP) have a larger proportional share of the total renewable payments due to their higher costs. Although solar energy employs many workers during a plant’s construction, it consumes a great amount of capital that could have created many more jobs in other parts of the economy. The Spanish Government began to realize these issues and in 2009, it slashed subsidies to solar power, subsidizing just 500 megawatts of solar projects, down from 2,400 megawatts in 2008. [iv] Thus, it is not unexpected that Spain has had to take further action regarding renewable energy even though it must meet renewable targets set by the European Union by 2020. The United States needs to make sure it doesn’t continue to follow in Spain’s footsteps. Between the loan guarantees issued by the Department of Energy, the rebates from the 1603 treasury program that expired last year, the production tax credits to wind technology that will expire this year without government intervention, and investment tax credits available to solar technologies, the United States has increased its deficit only to find that wind and solar energy remain at just one percent of the country’s energy supply and that several of the companies that it backed have failed wasting American taxpayers’ hard-earned dollars. Proposals mandating utilities to buy more expensive alternative energy simply stick consumers with higher bills and transfer their money to “green” energy companies. Spain’s recent policy decision confirms what is becoming clearer every day: alternative energy in its present form is expensive and governments, utilities and consumers cannot absorb the costs for very long. Eventually, the chickens come home to roost. 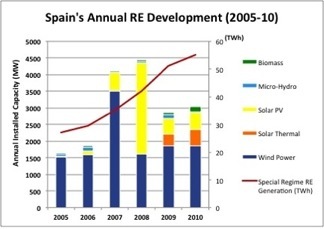 [iii] Universidad Rey Juan Carlos, Study of the effects on employment of public aid to renewable energy sources, March 2009, http://www.juandemariana.org/pdf/090327-employment-public-aid-renewable.pdf . [iv] Wall Street Journal, “Darker Times for Solar-Power Industry”, May 11, 2009, http://online.wsj.com/article/SB124199500034504717.html .